Through an examination and assessment of the body at a death scene, the medicolegal death investigator (MLDI) must be able to recognize circumstances that point to what manner of death occurred�be it natural causes, homicide, suicide, accident, or undetermined. 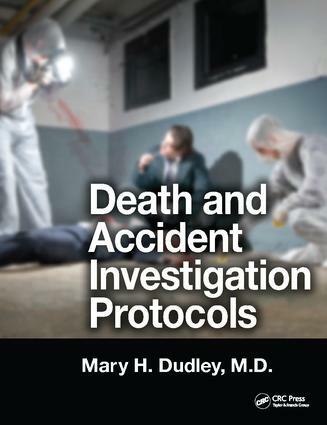 A handy reference for use in the field and in the lab, Death and Accident Investigation Protocols provides 34 checklists and forms to help investigators make these determinations. Categories of death covered in this guide include: Aircraft and motor vehicle accident Alcohol- and drug-related Blunt- and sharp-force injury Drowning Electrocution, exposure, and fire Gunshot Hanging Hospital- and nursing home-related Infectious disease Natural causes Occupational exposure Poison and toxic substances Sexual assault Suicide Formatted as a convenient 8 � x 11 spiral-bound book, this manual helps investigators know what to look for, what questions to ask, and how to categorize the scene and the physical injuries. The forms in the book can either be copied for use or downloaded from an accompanying CD, which allows for easy form modification. The text includes descriptive illustrations and diagrams associated with various categories of death. An essential tool for the busy investigator, the book facilitates the organization of information for a myriad of death scenarios.